The name Guggenheim is synonymous in America with philanthropy and achievement. In the 19th century, family patriarch, Meyer, amassed a fortune from mining and smelting. His business acumen and philanthropic ways were inherited by his large brood who made names for themselves during their lifetimes. Their good works and family name live on. Many members of the Guggenheim family are entombed in Salem Fields Cemetery, an historic Jewish cemetery which straddles the Brooklyn/Queens border. 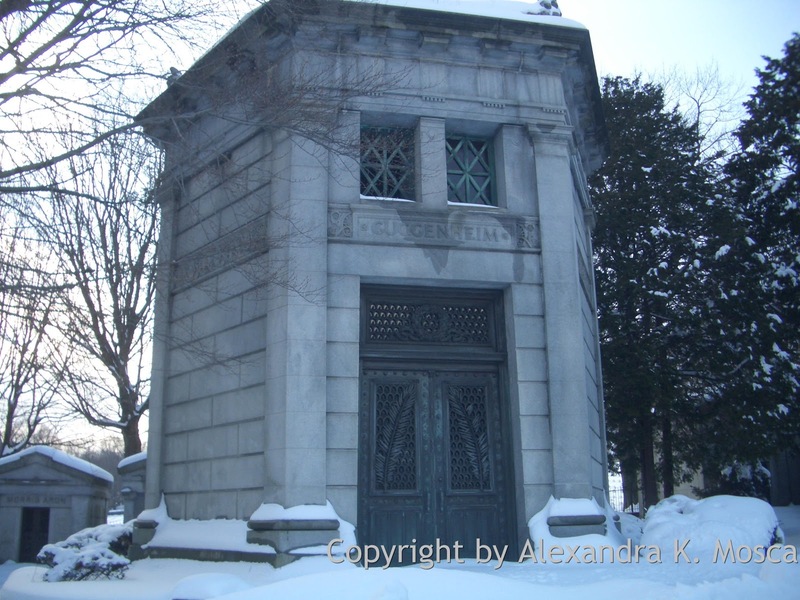 Their octagonal-shaped mausoleum was built in 1899 at a cost exceeding $100,000 and is the largest mausoleum in the cemetery. It was created by American architect Henry Beaumont Herts who is also responsible for a number of other monuments on the grounds. The white marble structure was modeled after the Tower of the Winds in Athens in the Italian neoclassical style. Barbara Myers Guggenheim, the wife of family patriarch Meyer, was the first to be entombed there after her sudden death in 1890. Meyer’s grand-nephew, Harry Guggenheim (my favorite), co-founder of the Long Island’s newspaper Newsday was also entombed within the structure after his death in 1970.